So that brings us to the question, “What exactly IS Opal Thai Food’s Pork Larb?” Or any pork larb? Or even larb! 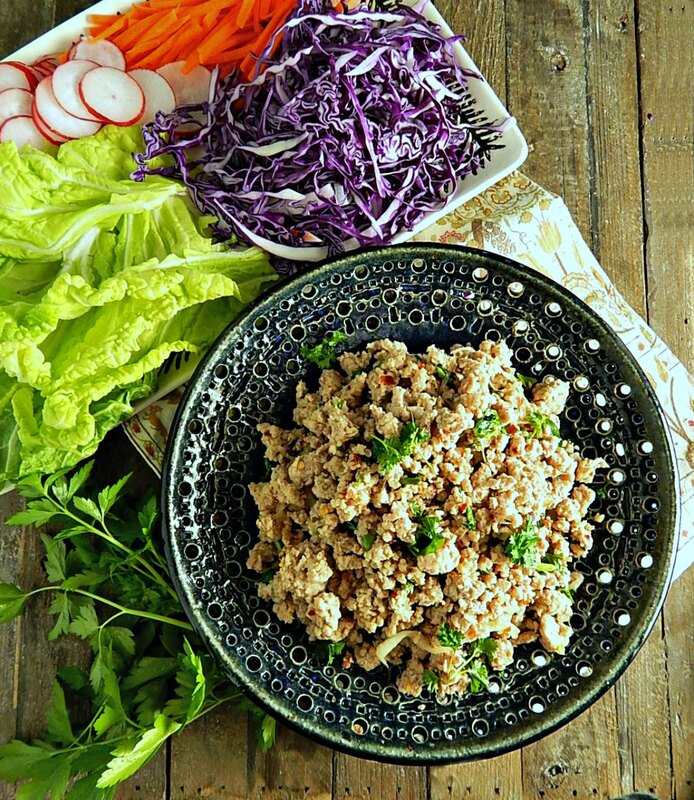 Larb or Laab is the national dish of Laos, a “salad” of spicy meat (it can be ground or minced beef, pork or chicken, duck or mushrooms – even minced leftovers) and various herbs and aromatics often served in lettuce (or cabbage) leaves or cups. Soo Larb is a salad made from meat. I know that’s gonna excite a lot of people right off the bat, right? Brightly flavored with a combination of lime, chile and fish sauce; the signature flavor is the toasted rice that grounds the Larb, khaokhoua. It gives the Larb a great flavor and slightest bit of texture. The addition of a little sweetness from palm sugar, brown sugar or honey adds to the complexity but is optional; although we Americans tend to appreciate the bit of sweetness (sometimes too much) in a lot of our Asian inspired dishes. In short, the flavors of Larb, like many dishes, depend on region, family recipes and your own taste – put in what you wish, vary the flavors and the heat, and make it your own. Serve with lettuce or cabbage leaves, an assortment of finely shredded vegetables, additional lime and glutinous (sticky) rice. I’ve found some people bulk at all the beautifully prepared veggies; if that’s you or a family member, try serving your larb with my Thai Inspired Coleslaw, instead. You can spread the rice on the lettuce, then add the meat and veggies and roll it, or if you’d like to be more authentic, use your hands to make a little cup of the sticky rice and fill. Or, you can use no rice at all and sub in fine rice noodles, instead. If you’re like my son, you’ll want some Sriracha on the side. Vegetables for Opal Thai Food’s Pork Larb – don’t forget lime! Unfortunately, when I checked the DDD site, there was no recipe for Opal Thai Food’s Pork Larb. I rewound a couple of times, watched carefully, and my recipe, below, was as close as I can get. It’s a simple, fast recipe and cooks in minutes. It’s cutting the veggies that take a bit of time, so start prepping the veggies ahead. A mandolin can really be your friend in cutting those veggies beautifully! Mandolins used to be super pricey but they’ve come down a lot and are so handy because you can make all kinds of things at home very easily. French fries, for instance! When you’re making Thai food, it’s really all about finding a balance of flavors, so go by taste; you might want to to watch the fish sauce carefully, maybe add a bit and then more if you’re sure of it; it adds the perfect umami flavor but some people find it a bit strong. If your tastes run to more sugar, add a bit more. Don’t be too afraid of what seems to be a large amount of the red pepper flakes; after the larb is finished, the flavors all settle and it’s only mildly hot. If you have Gochuchang, use that if you’d like. Be careful when cooking the pork. The bit of water helps a lot in getting the pork finished and broken down and I love to pull out my potato masher to make short work of it. The idea isn’t to brown the pork (and you will want to take it off heat as soon as the pink is gone; cooking more can make it rubbery) but just barely cook it through. It finishes up in the residual heat as you toss in the rest of the ingredients. I added the ingredients three times – what a feast for well under five bucks! Be sure to use any leftover vegetables (see, I just assume there won’t be any leftover Larb) by making a salad or slaw. Asian ingredients are always going to be cheaper at an Asian market, so if you have one, stop by. You might be surprised at the prices. If not, watch for any Asian sauces or condiments on sale during the Lunar New Year; the date varies every year. At my store the sale prices aren’t even advertised on sale during the New Year, so you’ll just have to take a peek. If you can’t get Asian pears, use a regular pear; I’ve seen either pear used in recipes but have often seen kiwi and sometimes, even apples. It is generally much more inexpensive to buy a pork shoulder, cube it up and pulse it in the food processor than to buy ground pork. You’ll have more control over the fat content, too. Remove any silverskin, large pieces of fat and cube it up, keep it cold, then pulse in two batches. You’ll only need a pound and it is likely you won’t be able to buy a pound, only, so if you go this route, have some other ideas for the rest. See Buying a Large Pork Shoulder. In a dry skillet, stirring often, toast a little rice until golden brown over medium-low. Take your time moving it off heat and shaking if it gets too hot, then returning to heat. Cool. Pulverize (but not quite to a powder) in a mortar and pestle, spice grinder or food processor. Alternatively, add to a Ziploc and crush. Any excess keeps in a tightly sealed jar for weeks. If not using ground pork cut the pork into cubes and pulse in two batches until finely minced, in the food processor. Add the pork cold to a skillet with about 1/4 cup of water, and stirring occasionally, cook until the meat almost loses all it’s pink color – remove from heat; the residual heat should continue to cook the meat through. Overcooking will result in a dry, rubbery larb. Toss with the onion, allowing it to wilt just a bit. Add fish sauce, lime, red pepper flakes, and the toasted rice. Add the sugar of choice. Just before serving, gently toss in the mint and parsley. Serve at room temperature with the vegetables. Sticky rice is easy, but you’ll need to soak it two to three hours ahead. place a metal sieve over a pan of barely boiling water, cover it with a bowl and cook until done, turning once. Cook for about 15 – 20 minutes until tender. This entry was posted in Click here for Bargain Meals, Click here for Fabulous Food Posts and tagged Asian, Bargain Meal of the Week, complete skillet meal, Diners Drive Ins and Dives, Heritage Recipe, Laab, Laotian, Larb, lettuce wraps, Opal's Thai, Pork, Thai. Bookmark the permalink.